Shire has agreed to license exclusive global rights to two rare cholestatic liver disease candidates—including the Phase III-ready maralixibat—to Mirum Pharmaceuticals, a San Diego startup that said today it secured $120 million in Series A financing to continue developing the drug. Maralixibat will become the lead candidate of Mirum, whose chairman and CEO Mike Grey originally oversaw the drug when it was LUM001 and he was heading its original developer Lumena Pharmaceuticals—which Shire acquired for more than $260 million upfront in 2014. Mirum plans to continue development of maralixibat and a second Lumena-discovered rare cholestatic liver disease candidate, volixibat, under the licensing deal with Shire—whose value was not disclosed. Maralixibat is an oral inhibitor of the apical sodium-dependent bile acid transporter (ASBT) that is being developed for Alagille syndrome (ALGS) and progressive familial intrahepatic cholestasis (PFIC). Maralixibat is under study for its ability to prevent accumulation of excess bile acids and control extreme itching associated with cholestatic liver diseases such as ALGS and PFIC. Mirum reasons that maralixibat could be a first-in-class oral drug for these conditions. The startup plans to focus its initial efforts in these two pediatric indications, but said it also sees potential to develop maralixibat for additional pediatric and adult cholestatic liver disease indications. In its announcement of the financing, Mirum also said that maralixibat succeeded in the Phase IIb ICONIC trial (NCT02160782), which assessed the drug in subjects with ALGS, based on a 48-week interim analysis. Full data is to be presented at an unspecified liver disease meeting next year, the company said. In addition, a single-arm, open-label Phase II trial (NCT02057718) showed that a subset of patients with PFIC2 responded to maralixibat, with a sustained (>2 years for some) reduction or normalization of serum bile acids and reduction of pruritus, Mirum disclosed. Based on those results, the company has received the FDA’s breakthrough therapy designation for maralixibat in patients with PFIC2. Mirum said it plans to initiate Phase III confirmatory studies in patients with ALGS and PFIC in 2019. 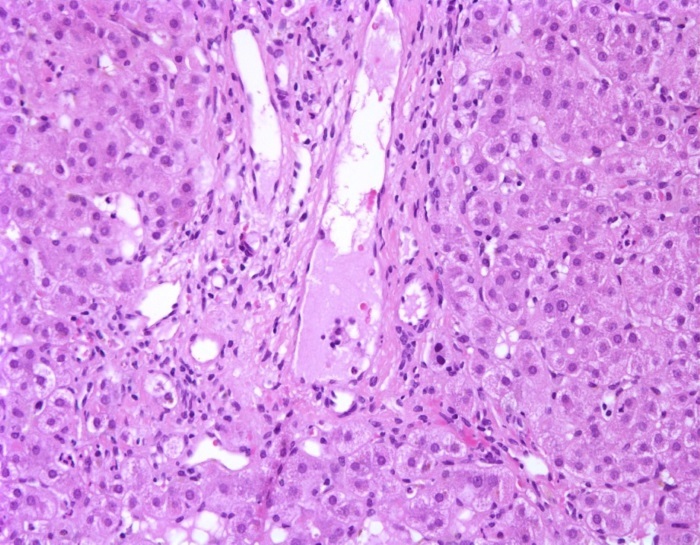 Volixibat—which Shire had named SHP626—was the subject of a Phase II trial (NCT02787304) assessing its safety, tolerability, and effectiveness in adults with nonalcoholic steatohepatitis (NASH) with liver fibrosis. The placebo-controlled trial, which enrolled 84 participants, was terminated as of the trial’s most recent August 14 update on ClinicalTrials.gov. Mirum also announced several executive hires with backgrounds that included experience at Lumena and Tobira. Pamela Vig, Ph.D., has been named CSO; Lara Longpre, chief development officer; Shelly Xiong, Ph.D., VP of regulatory; and Chris Peetz, president and a member of Mirum’s board of directors. Mirum’s financing was led by New Enterprise Associates (NEA), with participation from Deerfield Management, Frazier Healthcare Partners, Novo Holdings A/S, Pappas Capital, RiverVest Venture Partners, and Rock Springs Capital. In connection with the financing, Mirum has also appointed to its board: Ed Mathers, partner, NEA; Patrick Heron, managing general partner, Frazier Healthcare Partners; Jonathan Leff, partner, Deerfield; Tiba Aynechi, Ph.D., partner, Novo Ventures; and Niall O’Donnell, Ph.D., managing director, RiverVest. Dr. O’Donnell is among Mirum co-founders and advisors who formerly worked with Grey at Lumena, as are Alex Dorenbaum, M.D., Susan Dubé, and Ciara Kennedy, Ph.D.
“The substantial investment we have made in Mirum and the outstanding syndicate of savvy biotech investors underscores the value we ascribe to maralixibat, as well as our confidence in the company’s management team to execute on an aggressive development plan,” Mathers stated.